The Summer of Love didn't really end in 1967, like they want you to believe it did. It's still alive and well, but it just needs one far-out lady to really resurrect it. What better flower child to do that than you... and what better night to bring back the era of free love than the biggest party night of all... Halloween? But to truly be a representative of the decade everyone wishes they could have been a part of, you'll need more than a laid-back, freewheelin' attitude and an open mind. You'll need the right getup. 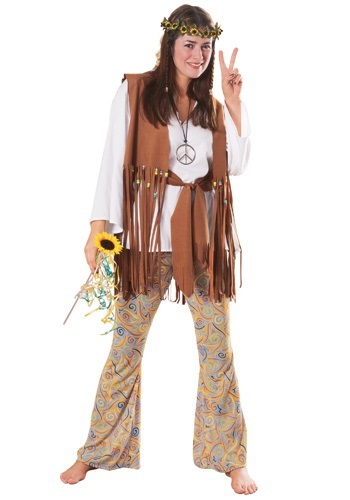 And there's none better and more iconic than this Adult Hippie Love Child Costume! It's got everything you need to immediately make the groovy impression you're going for. That includes a fringe vest with tassel-like strips and multicolored beads; a billowy, long-sleeved shirt; bellbottoms with a truly psychedelic print; and a waist sash to tie the whole getup together. And the costume is versatile, too... bring along a protest sign (like, "No Nukes," maybe? ), peace symbols, or heck, even a pair of Birkenstocks, and you'll be the very definition of "flower child." 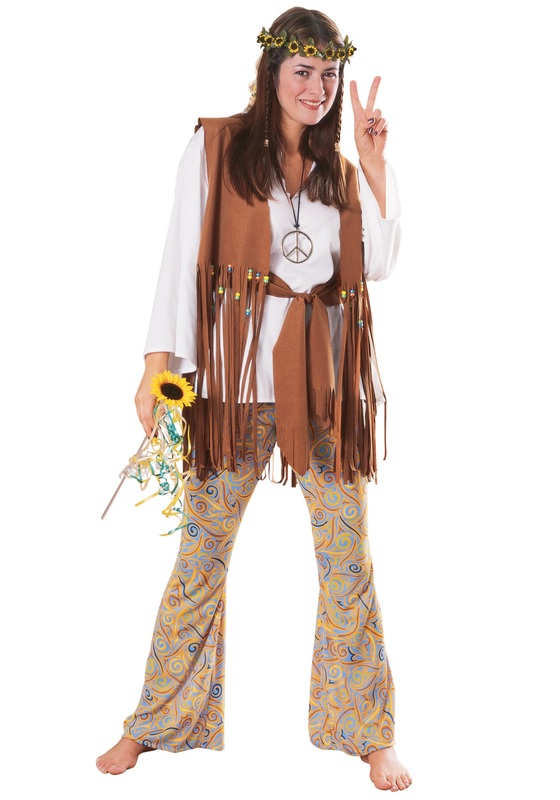 So whether you're going out for Halloween, or you're recreating Woodstock in your back yard, the Adult Hippie Love Child Costume is the first step in a journey back to a much more exciting period of history. And it's great for "group" costumes, so don't forget to have a look around at our wide selection of retro accessories and costumes!